Another week has absolutely flown and whereas last Friday after my stress of a week, this week has been full of fun and exciting things and loads of big changes so whittling the list of my favourite things was a much more difficult job. Last Friday the Christmas spirit really hit my life. My other half had the week off so we took the opportunity to decorate the house from top to bottom with all things festive whilst we had the chance to do it together. We invested in a 6ft tree to go along with my 4ft one that travelled home with me from my university days, only to realise the 6ft one was a bit too big to go in the living room but hey, now we have a bedroom that is decked to high heaven. The trees are covered in baubles, santas, penguins, candy canes, tinsel and lights, both with a sparkly star topper and a whole load of silver strands which we artfully placed threw on the branches. We also turned the living room into a grotto with tinsel on every shelf, both rooms have streamers all over the ceiling and I also snapped up some stand alone reindeer, presents and nordic decorations from Cardiff the day before. 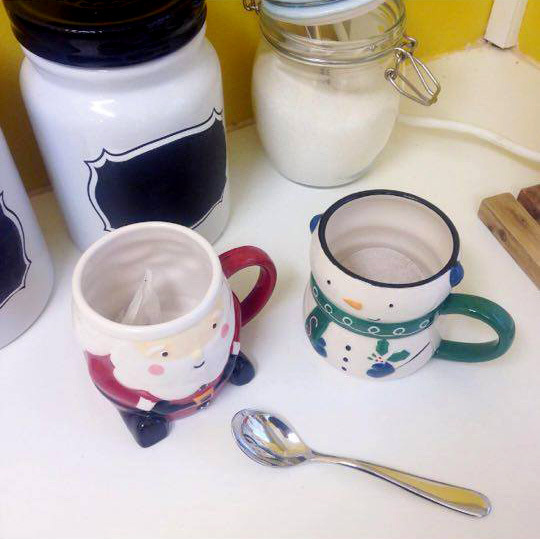 I even finished it up with a star wreath on the front door and made my first cup of tea this season from my santa and snowman mugs. I am whole heartedly invested and counting down the days until the 25th (literally, it's advent). I promised an update and I won't disappoint. I HAVE MOVED. Yuh huh, this summer I moved home in with the parents and complained a lot about the compromises and the strain it puts you under and then 6 months later, I'm off again. Last week after passing my driving test and signing for a car (more on that) I boxed up my belongings and made the big move.....15 minutes down the road and in with the boyf. The poor boy didn't know what hit him when I rocked up and took over every room but then I did a load of washing so win win. Following my move all the way to the other side of the A48, on Saturday night I had my parents and grandparents round to see the new place and whilst I couldn't whip up a three course meal (I *might* have not been to the shops and had NOTHING in), we did all sit round the dining room table and have a cuppa and catch up and it was so nice to bring them somewhere new and spend some QT. If you didn't watch the first series with Martin Freeman and Billy Bob Thornton and you've therefore missed series two with Ted Danson and Kirsten Dunst, you need to get in on it. It's on Channel 4 and it's the last episode next week but seriously, so good. The accents, the snow, the violence, the characters, the humour, it is a mad mix of everything and it just provides shocker after shocker. I spent this week's episode texting my Dad and brother all "OMGOMGOMGOMGOMGOMGWTF". It is hugely compelling and recommended to all. Dec 12 My Illustrating Playlist.